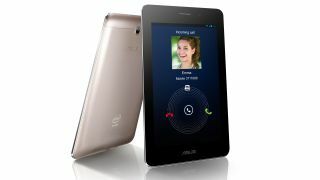 Asus has unveiled its latest handset at MWC 2013 - the Asus Fonepad, which it describes as 'a phone that's also a tablet'. The company has obviously seen that, hey, that Samsung Galaxy Note's doing quite well, and decided it wants a piece of the 'phablet' action. So what we're looking at here is a 7-inch device with a 1280x800 IPS screen, Intel Atom Z2420 processor and a 3MP rear-mounted camera. There are dual microphones to play with, 720p video, 3G connectivity and a microSD slot. It's not exactly the most beautiful device we've ever seen but the big news here is the Fonepad price - the phone-tablet-thing will start from $249 (£165 / AU$241) when it goes on sale in March. That's a helluvalot cheaper than its bigger sibling, the Asus Padfone Infinity, which was also announced today. We'll be braving the media scrum shortly to bring you our hands on Asus Fonepad review so stay tuned for that.